Anyone remember the early days of blogging? You know, back when we all had Blogger/Blogspot addresses (no self-hosting), simply talked about food and got to know each other–the days when none of us made money off it and everything was simple? See, this site is self-hosted. And I don’t understand a thing about it. Which is why it’s been going down periodically (and for quite awhile yesterday). I have a friend who *does* know about all this jazz, so she’s been working hard at finding my stupid errors and making them right–I don’t know where I’d be without her. But, dang, why does this all have to be so complicated? Technology, I kinda sorta hate you a lot these days. Things that aren’t technological: pasta, asparagus, pesto. And what to do with a sorrel plant grown out of control? Chop it all down and whirl it into some pesto. I relish in the simple days too.. and well, I am still there. You know things have changed when you no longer even give a recipe just ingredients. Now you know the kitchen has changed, too. So true on the kitchen changing; sometimes I’m amazed at how much I’ve grown culinarily! We still have no sorrel anywhere in CA–maybe I will seek out a plant or two next year. It sounds like the perfect ingredient for a pesto! I’d recommend picking up some seed–I direct sowed last spring and have harvested 3 different times since then (it keeps growing back). Super easy to grow! Thanks for the idea. I just got some sorrel at the Farmer’s Market and was thinking about what to do with it! i think i started on the cusp of now the way it was back in the day. i wish things were more simple. i feel like it’s getting out of hand sometimes. I’m jealous of your overgrown sorrel – my hens scratched mine up two years ago and I keep forgetting to reseed it. I may have to pick some up from my neighbor – between your pesto and the two recipes Ottolenghi just put online, I’m really craving the stuff. Is that your own asparagus? I’ve been harvesting mine for a couple of weeks now, it’s so good that I usually eat it all before I even get back to the house. Haven’t bit the bullet on planting asparagus yet. I think I will this year though. It seemed so permanent, planting asparagus…guess I’m growing up and settling down now. So strange. Yet nice. Yes, at the Guardian! And definitely plant asparagus – you should wait until the third year to start cutting, so the sooner you plant it the better. Simple food and simple times are the best of times. Beautiful, beautiful dish! I miss those days. I have stopped following many blogs that used to be favorites, that I used to feel personally connected to, because they turned their sites into commercial ventures, with more giveaways and paid endorsements than creative content. And um I’m still on blogger. I work more than full time and haven’t had the energy to replace it. Have I been left behind? Probably. Do I still post, hoping someone out there still reads? Yes, sometimes. I’ve only recently discovered the joys of sorrel, and still haven’t ventured to cook it myself, but this sounds like a nice, easy introduction. 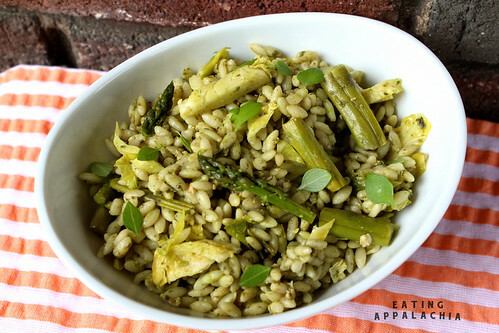 Such a perfectly springy bowl of cozy risotto! I love everything about it, and wish I was lucky enough to have your “problem” of excess sorrel.